We decided to splash out with our new shower room, literally! A complete wet room which allows easy showering facilities for our less able residents. Access is very convenient and carers can maneuver around residents very easily to give them a good wash and pamper. Able residents are also welcome to use it too. The soft ambient LED lighting creates a very relaxing atmosphere for a comfortable warm shower and wash. The idea for this shower room was inspired by a health club that the owner visited whilst on a recent break and he wanted to create something similar for the residents in the home. We believe that people have the right to some comfort and luxury in their later years and that senior life should be a reward for a long and well lived life. 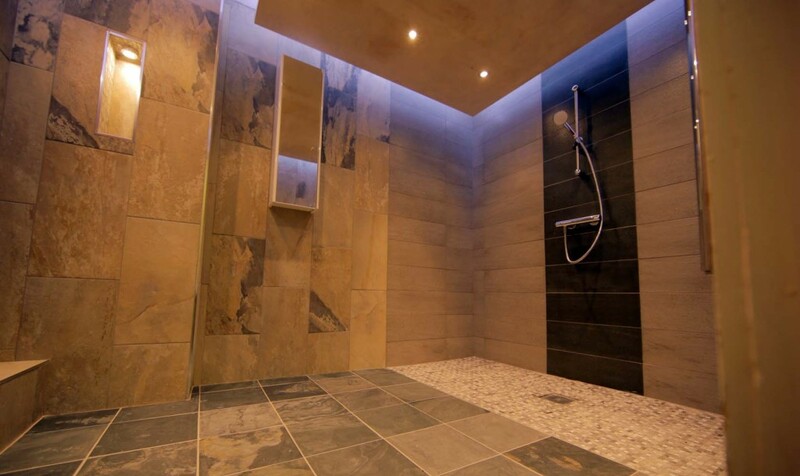 One of the features of this shower room was the LED lit suspended ceiling. It took some extra work but we feel it really adds to the wow factor of the room. A small lit recess was also created to make a feature out of an ornament in the room and we are still on the lookout for that perfect little feature. The floor in the room has a gradual slope to ensure that no matter where the water splashed it always falls back to the main drain acting as a fully functional and easy to clean wet room. By placing the shower centrally, access is easy and comfortable for carers and residents and the mosaic tile create a non slip surface that is also very aesthetically pleasing. Wow, It looks like a posh spa, I would love this in my house! The feedback so far has been great! Residents really like it and relatives and visiting professionals have been a little bit shocked by it. Wow! has been the biggest word we have heard and we have even had many family members asking us how it was done so they can build a similar room in their own houses. We are very proud of it and are moving forward to our next project, a beautiful toileting room with walnut paneling, a floating sink and a floating self cleaning bi day toilet that will improve hygiene standards and provide a well earned ease on the workload on our amazing care team. Come and Join Us for a Mother’s Day Celebration You Won’t Want to Miss!